Over the past couple of months I've been lucky enough to have been sent some lovely new products from the MUA 2015 Spring Collection. I've worked with MUA for a few years now and they still continue to be one of my favourite brands for many different reasons. Over the next few weeks I've got quite a few reviews of these new products to share with you so look out for them. I've already reviewed the special limited edition 5th Birthday Palette* that I've been really enjoying using so go over and read that if you haven't already, it's a palette that I think ever MUA fan should have. 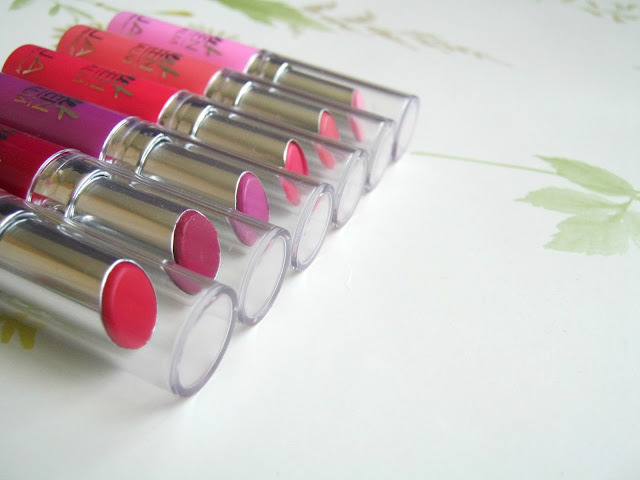 Today is all about a collection of 6 tinted lip balms though, they've impressed me more than I expected them to! "MUAs Sweet Sheen is a soft balm that moisturises whilst also adding a subtle shimmer of colour to your lips!" If you are a regular reader of my blog then you'll know that I love products like these. I've never been one to slick on a coat of a bold red lipstick, I much prefer something a little lighter and usually with some kind of added moisture in. 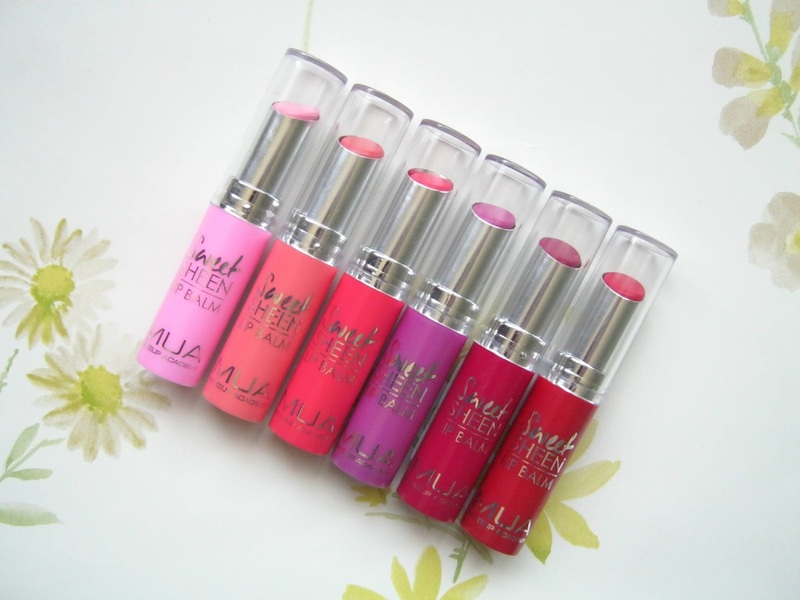 MUA have continued to impress me over the years so although I knew that these wouldn't be super pigmented, as with any tinted lip balm, I did hope that they would give enough colour to my lips to make a noticeable difference. I know that because of the lack of pigmentation a lot of people tend to stay away from products like these but hopefully the pictures below will convince you to give these a try! The first 3 shades (Pink Lilly, Peach Dream and Coral Reef) are the lightest colours so I prepared myself to perhaps not be able to achieve much with them but I was pleasantly surprised. You can see that even Pink Lilly makes a small difference and creates a light bubblegum pink sheen. All 6 of the shades leave your lips with this pretty shine, living up to their name very well. 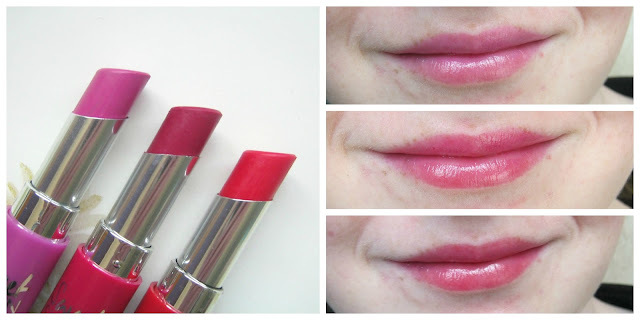 Coral Reef is definitely my favourite out of the 3, it's perfect for Summer and a good place to start for those who aren't too confident wearing a bold lip colour. The next 3 shades (French Violet, Cherry Bomb and Rouge Rumba) really did blow me away, I never expected this much pigmentation! These definitely felt more like lipsticks than lip balms and I doubt you would be disappointed by them when it comes to the pigmentation and bold colours. Cherry Bomb stood out to me the most out of these 3, I feel comfortable wearing it despite it being a little bolder than what I usually go for. Again if you usually aren't comfortable wearing brighter colours then I'd recommend this as a gentle introduction. At the end of the day though they are still lip balms so their lasting time definitely doesn't resemble that of a lipstick. Of course the darker colours last longer but I'd say the maximum wear time is definitely no more than an hour and a half, perhaps 2 hours at a push for the last 3 shades. But this is expected as they are tinted lip balms so it definitely isn't a bad thing, if you are looking for a longer wear time then I'd encourage you to take a look at MUAs lipsticks instead. However personally I have no problem with regularly topping these up since they are so easy to apply though. 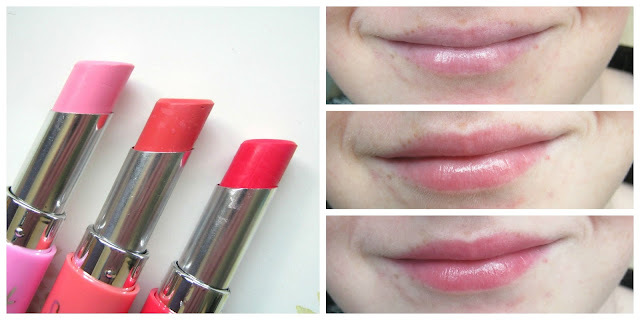 There is one bonus to them being lip balms over lipsticks though, they have the ability to moisturise your lips and they make mine feel really soft and smooth whereas some lipsticks can bother me because of how dry they feel. This is definitely a big reason why I tend to reach for tinted lip balms over other lip products on a regular basis. The biggest bonus of course has to be the price though, at only £2 each they really are something I'd recommend that everyone tries, I'm sure out of 6 shades there must be something that catches your eye! I personally would recommend Cherry Bomb the most though. 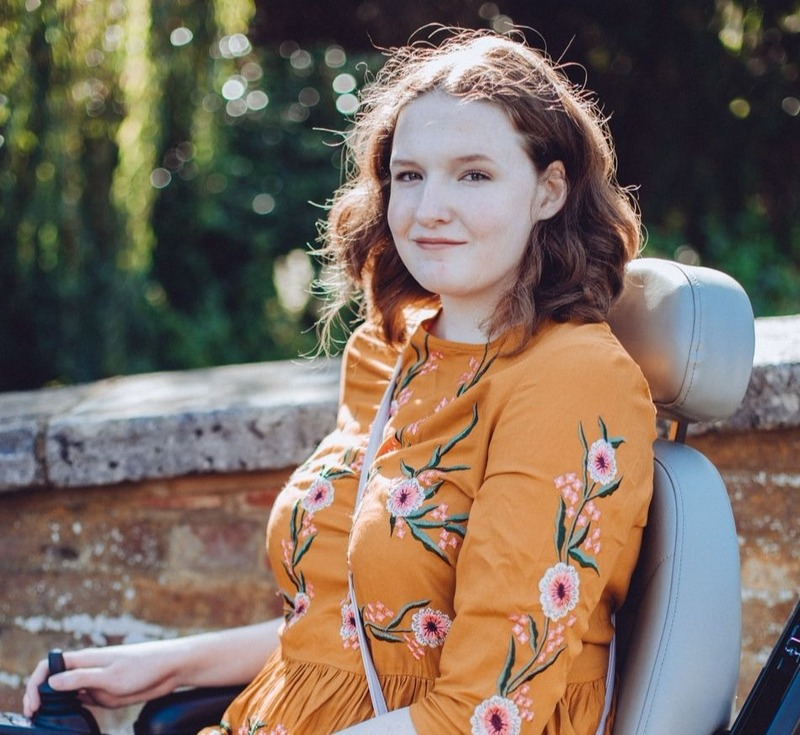 If you haven't already seen, I've got a second blog! Head over to Not Just A Diagnosis to learn more about it. MUA are a pretty great brand! I love their shimmering skin perfector!